World military spending rose in 2016 to $1,686 billion, up 0.4% in real terms from the previous year, and equivalent to 2.2% of global GDP, research from the Stockholm International Peace Research Institute (SIPRI) shows. It was the second consecutive rise since 2011 when spending reached its peak of $1,699 billion. Spending rose in the US for the first time since 2010, and in Western Europe it was up for the second year in a row. 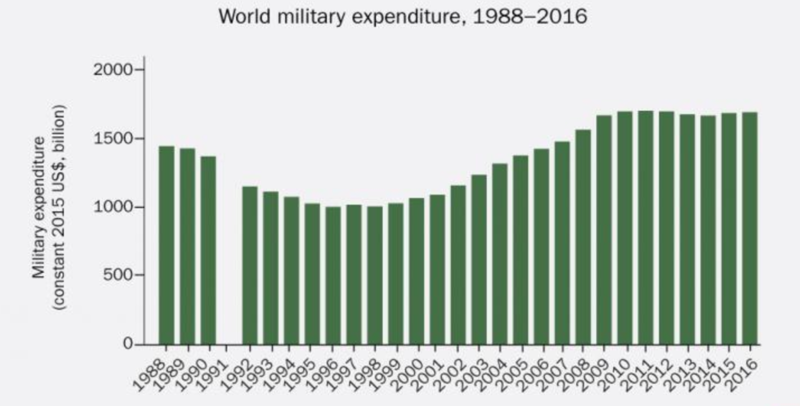 However, SIPRI’s report, Trends in World Military Expenditure, 2016, also reveals a marked decline in military spending by oil-exporting countries, hit by the slump in oil prices. Spending also varies significantly between regions: it continues to rise in Asia and Oceania, Central and Eastern Europe, and North Africa; by contrast, it fell in Central America and the Caribbean, the Middle East, South America and sub-Saharan Africa. In many oil-exporting countries, increases in military spending over the past decade have tracked high oil prices. The dramatic oil-price fall and the continuing price slump, has led to significant government spending cuts in many of oil-exporting countries since late 2014, including spending on military. Some of these cuts have been so substantial, the SIPRI report says, that they have impacted regional and sub-regional spending trends. The biggest military spending cuts were all connected to falling oil revenue: Venezuela (–56%), South Sudan (–54%), Azerbaijan (–36%), Iraq (–36%) and Saudi Arabia (–30%). Other notable decreases were in Angola, Ecuador, Kazakhstan, Mexico, Oman and Peru. Only two of the 15 countries with the largest falls in spending in 2016 are not oil exporters. 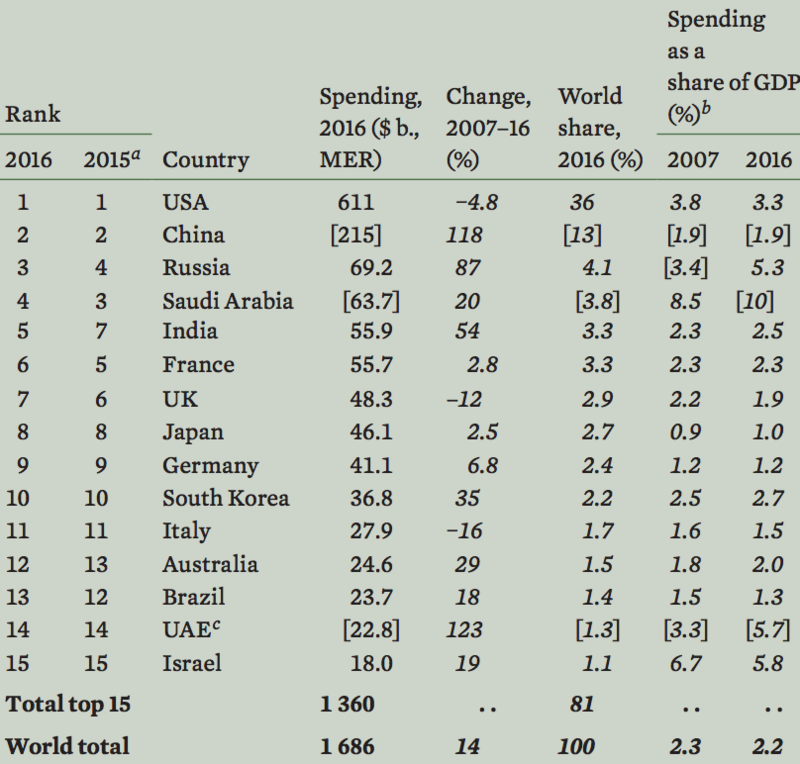 The US remains the world’s biggest military spender by a considerable margin; expenditure grew by 1.7% between 2015 and 2016 to $611 billion, representing 36% of spending worldwide. Despite this growth, US military spending remains 20% lower than its peak in 2010. China, increased its spending by 5.4%, to $215 billion; this marks a much lower rate of growth than in previous years, the report reveals. Russian spending was up 5.9% in 2016, to $69.2 billion, making it the third-largest spender. Saudi Arabia, by contrast, the third-largest spender in 2015, dropped to fourth place in 2016, after cutting spending in 2016 to $63.7 billion, a drop of 30% over the previous year. Countries in the Middle East cut military spending overall by 17%. The major decrease, other than in Saudi Arabia, was in Iraq, where it was down 36%. Military spending in this region, however, still represented 6% of GDP in 2016. India’s military expenditure was up by 8.5% to $55.9 billion, making it the fifth largest spender. 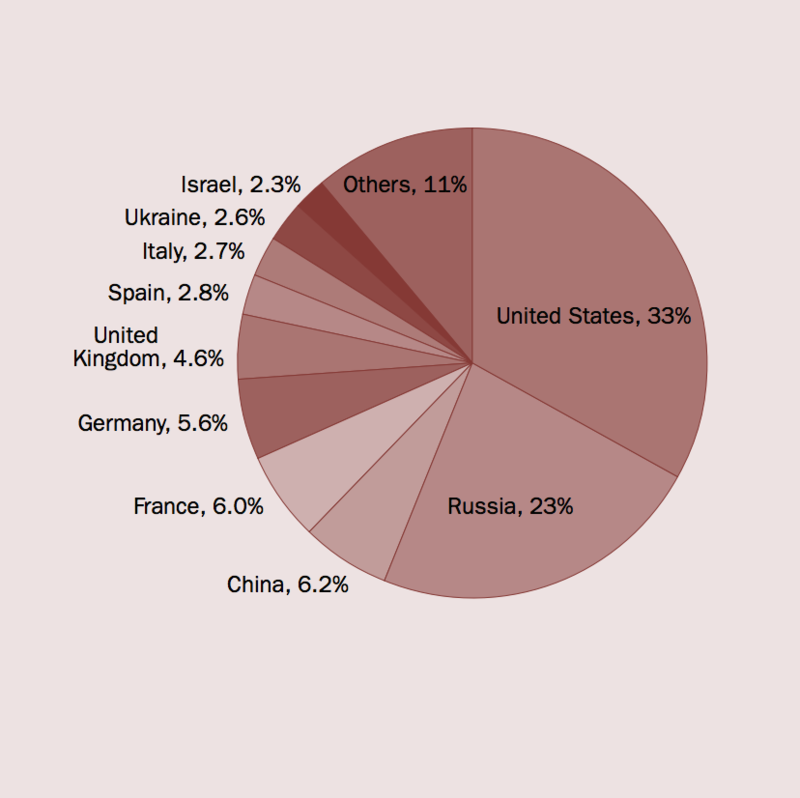 The 15 biggest spenders accounted for $1,360 billion of global military expenditure, or 81%. Between 2007 and 2016, China saw the largest growth in military spending, with an increase of 118%, the report notes. It was followed by Russia (a rise of 87%) and India (a rise of 54%). Spending in Africa fell by 1.3% in 2016, the second year of decrease following 11 consecutive years of increased spending. This was mostly due to spending cuts in oil-exporting countries in sub-Saharan Africa. Military spending in Western Europe was up 2.6% in 2016, the second consecutive yearly rise. “Many of the European countries with the largest relative increases in military spending between 2015 and 2016 are in Central Europe,” the authors report. 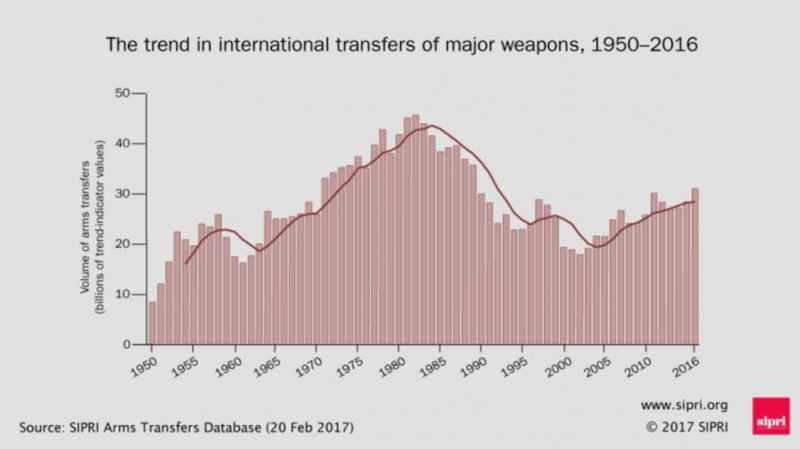 Separately, in a report detailing Trends in International Arms Transfers, 2016, SIPRI data shows that transfers of major weapons between countries between 2012–2016 reached their greatest volume for any five-year period since the end of the Cold War. Transfers, which include arms sales, gifts and production licences, have grown continually since 2004, and were up by 8.4% between 2007–11 and 2012–16. The volume of transfers was driven in large part by rising demand from the Middle East and Asia. Between 2007–11 and 2012–16, arms transfers to countries in the Middle East rose by 86% and amounted to 29% of all global imports in the period 2012–16. Saudi Arabia was the world’s second largest arms importer in 2012-16 (after India), with an increase of 212% compared with 2007–11. Arms imports by Qatar went up by 245%. Most other states in the region also increased arms imports. ‘Over the past five years, most states in the Middle East have turned primarily to the USA and Europe in their accelerated pursuit of advanced military capabilities’, said Pieter Wezeman, Senior Researcher with the SIPRI Arms and Military Expenditure Programme and one of the report’s authors. The report shows that arms imports by countries in Asia and Oceania were up by 7.7% between 2007–11 and 2012–16, and made up 43% of global imports in 2012–16. India was the world’s biggest importer of major arms in 2012–16, and accounted for 13% of the world’s total. 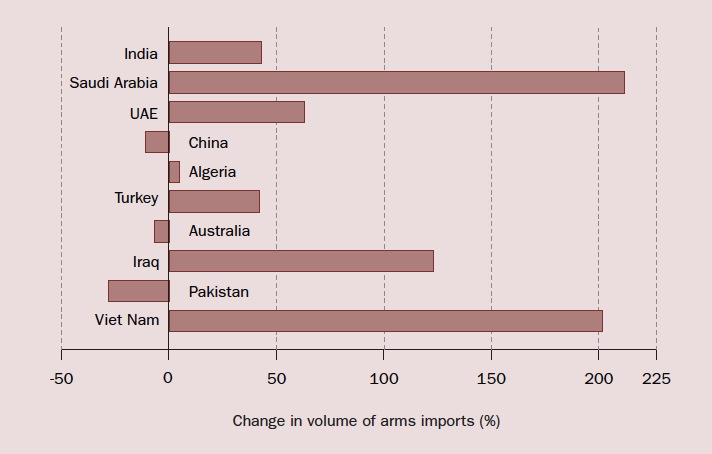 Between 2007–11 and 2012–16 India’s arms imports grew by 43%. In the period 2012–16 India’s imports were far higher than those of regional rivals China and Pakistan. Imports by countries in South East Asia were up 6.2% between the periods 2007–11 and 2012–16. Vietnam’s growth in arms imports was especially notable: they increased by 202% between 2007–11 and 2012–2016, taking it from it from 29th largest importer to the 10th largest. “With no regional arms control instruments in place, states in Asia continue to expand their arsenals”, commented Siemon Wezeman, Senior Researcher with the SIPRI Arms and Military Expenditure Programme and one of the report’s authors. The US remained the biggest arms exporter in 2007–2016, responsible for a third of global arms exports. Its exports increased by 21% compared with the period 2007–2011, with almost half going to the Middle East. “The USA supplies major arms to at least 100 countries around the world—significantly more than any other supplier state,” said Dr Aude Fleurant, one of the report’s authors. Russia had a 23% share of exports in the period 2012–16, with 70% of its arms sales going to India, Vietnam, China and Algeria. China’s share of global arms sales rose from 3.8% to 6.2% between 2007–11 and 2012–16. This increase now firmly makes it a “top-tier supplier, like France and Germany, which accounted for 6 per cent and 5.6 per cent, respectively,” says the report. · Algeria was Africa’s largest arms importer responsible for 46% of all imports to the region. · The largest importers in sub-Saharan Africa were Nigeria, Sudan and Ethiopia, all of which are in conflict zones. · Total arms imports by states in the Americas fell by 18% between 2007–11 and 2012–16, but there was considerable variance in import volumes. Colombia’s arms imports fell by 19%, while Mexico’s grew by 184% in 2012–16 compared with 2007–11. · Imports by countries in Europe fell by 36% between 2007–11 and 2012–16. However, deliveries of advanced combat aircraft began in 2012–16, and ongoing deliveries will drive import volumes up in the coming years.